Contemporary, Single Family,Detached - Point Pleasant, NJ Attention boaters!! 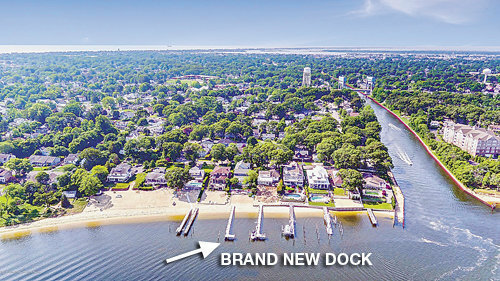 Manasquan riverfront property with riparian grant and brand new 140' dock. Plenty of room for a pool. NO FLOOD INSURANCE REQUIRED!! Water did not reach the house during Super Storm Sandy. Only minutes by boat to the Manasquan inlet and ocean. Located 5 houses East of the canal with its own sandy beach. One and a half mile drive to Point Pleasant Boardwalk and the Manasquan Inlet. Walking distance to downtown shops and restaurants. Master bedroom, glass conservatory and custom deck have views as far as the rt 70 and rt 35 bridges. Kitchen has granite counter-tops, custom cabinets and high end stainless steel appliances including a DCS professional grade oven, 2 dishwashers and wine fridge. Oak hardwood flooring throughout. Partially finished heated basement.